Also known as the Lord's Supper, the Divine Liturgy, Mass, or Holy Communion, the Eucharist is the center of our common worship as the church. In the Eucharist, we as Christians encounter the Real Presence of Christ. During the Eucharist we remember the sacrifice that Christ made on our behalf, and glory in our union with him in his resurrection. We celebrate the Eucharist frequently, as we believe it to be the spiritual food we need to sustain us in our spiritual journeys and everyday life. At St. Stephen's, we celebrate the Eucharist each Sunday and on some of the major feast days of the church year. Next, we listen to Scripture, typically hearing four different readings from the Bible. A reading from the Old Testament, a Psalm, something from the Epistles in the New Testament, and (always) a reading from the Gospels. The psalm is recited by the congregation, but sometimes we sing it. The priest proclaims the Gospel reading from the middle of the congregation, as a sign that Christ the Word is present in the midst of the church. After the Gospel, a sermon interpreting the readings is preached. Our sermons tend to last anywhere from 8 to 14 minutes. The congregation then recites the Nicene Creed, which has been the core statement of faith used by Christians since it was written in the 4th century. Next, the congregation prays together—for the Church, the World, and those in need. We pray for the sick and the suffering, thank God for all the good things in our lives, and finally, we pray for the dead. The presider concludes with a prayer that gathers the petitions into a communal offering of intercession. On most Sundays, the congregation then confesses their sins before God and one another. This is a corporate statement of what we have done and what we have left undone, followed by a pronouncement of absolution. In pronouncing absolution, the presider assures the congregation that God is always ready to forgive our sins. After some announcements are made, we sing a hymn while an offering of money is collected and is brought up to the Altar along with bread and wine. The priest sets the table, putting the wine into a cup called a chalice and putting the wafers of bread on a shallow dish called a paten. The congregation responds to this prayer with a great Amen, and we then recite the Lord's Prayer. Visitors who are not baptized Christians are welcome to come forward during the Communion to receive a blessing from the priest. 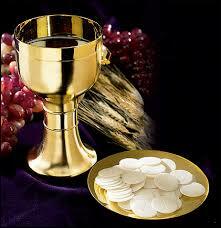 For more on our practices about who may receive Communion, see this page.